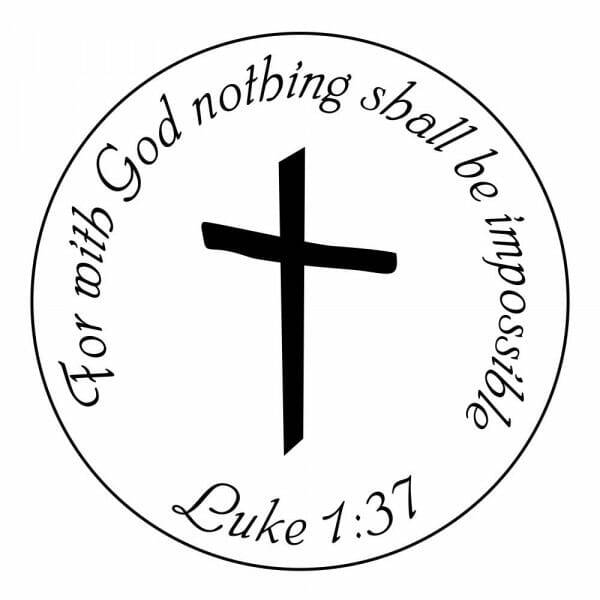 "For with God nothing shall be impossible  Luke 1:37" - this bible verse is perfect for wishing strength for the newest family member. The stamp is ideal to be used on photo albums and other keepsake projects as well as on birth announcement and thank you cards. The stamp model is Trodat's Printy 4638 which is a self-inking stamp. This means that the ink-pad is built into the stamp so no separate ink-pad is required. The stamp will last a lifetime as replacement ink-pads are available (order no 6/4638). You can choose between 5 different ink-pad colours (black, blue, green, red and violet). The round printed impression has a diameter of 38 mm. The stamp produces thousands of clear images. Customer evaluation for "Craft Stamp - For With God"